President Barack Obama has begun his final full year in office by taking new executive actions on guns. And as of the fourth day into that last full year in office, a new analysis by Vocativ shows that gun violence has killed at least 147 people in the US. Just 15 minutes had passed in 2016 before the year’s first fatal shooting. A man in his 40s was shot at 12:15 a.m. in Jacksonville, Florida, on Friday; he died later that day. By 12 am Monday morning, at least 147 people, including a two-year-old girl in a murder-suicide in Los Angeles, and an 80-year-old man in a second murder-suicide in Miami. For the analysis, Vocativ searched Google for stories about gun violence in 2016, and compared the findings with the Gun Violence Archive. It found that at least 119 men and 28 women across 34 states had been shot dead by Monday. These figures are, if anything, an underestimate. Based on 2013 data, there are approximately 92 gun deaths on average each day in America — about 30 per day are homicides, and roughly 58 are suicides. So one would expect there to be at least 368 gun deaths already in 2016 — although that’s based on an average over a whole year, so it might not apply to the beginning of 2016. While the total number of homicides is dropping, along with all crime, the reality is no other developed nation deals with the same kind of gun-related bloodshed that the US does: America has nearly six times the number of gun homicides as Canada, more than seven times as many as Sweden, and nearly 16 times as many as Germany, according to UN data compiled by the Guardian. 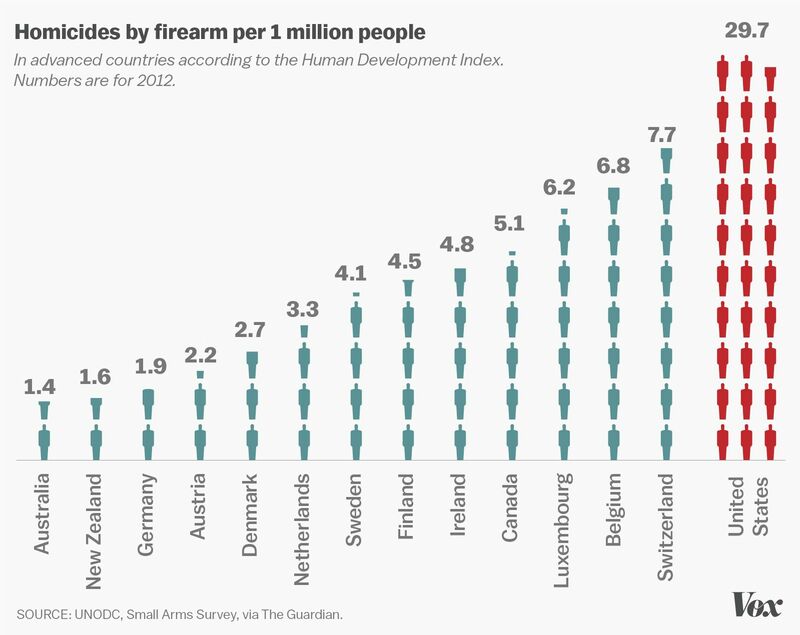 America also has way more guns. According to a 2007 estimate, the number of civilian-owned firearms in the US was 88.8 guns per 100 people, meaning there was almost one privately owned gun per American and more than one per American adult. The world’s second-ranked country was Yemen, a quasi-failed state torn by civil war, where there were 54.8 guns per 100 people. These two issues — the numbers of guns and gun deaths — are linked: Reviews of the empirical research by the Harvard School of Public Health’s Injury Control Research Center have consistently found that when controlling for variables such as socioeconomic factors and other crime, places with more guns have more gun deaths. As a result, Americans live in a country where just four days into 2016, we have more gun deaths than some countries do in an entire year. From Obama’s perspective, that’s why he needs to take steps to restrict access to guns, even if executive actions can’t address the full scope of the issue in the way congressional action could.